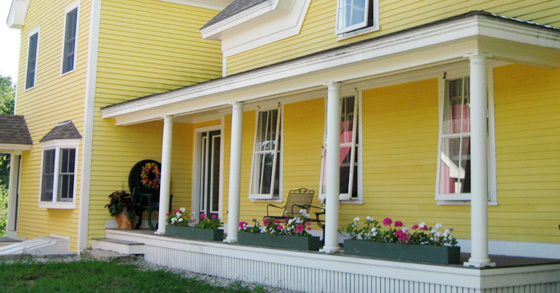 Historic windows and doors can often be repaired or upgraded to improve energy efficiency and occupant satisfaction. To further enhance energy saving qualities, a good storm window can be installed. However, even if historic windows are beyond repair and replacements are the only viable option, there are many factors to consider. 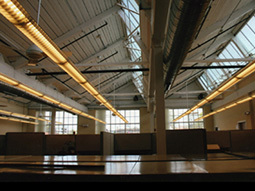 Historic buildings include many features, such as operating clerestory or cupola windows, designed to maximeze ventilation and natural light. The common misconception that replacing windows will save as much as 50% in energy costs is simply not true. The windows in many historic buildings have functioned for more than 100 years and, with regular maintenance, will usually survive longer and work better than any replacement window. A replacement window does not generally pay for itself in a reasonable length of time. Unlike historic windows, new window assemblies cannot be repaired; they can only be replaced once again. The sustainable choice is to repair historic windows whenever possible. Keep in mind that energy losses occur both by conduction through the glass and by infiltration around the sash and the frame. Conducting a window inspection is a good way to assess the overall condition of your windows and to determine whether repair or replacement is the better alternative. Caulking, weatherstripping, and replacing deteriorated glazing compound to seal air leaks should always be done before considering replacing historic windows. It also may be helpful to consult Evaluating Historic Windows for Repair or Replacement, which provides guidance for projects using the Federal Historic Preservation Tax Incentives to rehabilitate historic buildings. Historic home with wooden storm windows. Windows, whether historic or new, are a source of heat loss because they are a poor thermal barrier compared to solid walls. Adding storm windows can improve the thermal efficiency of any window. If a building has existing storm windows, ensure they are tight fitting and in good working condition. Consult the energy audit to determine if adding storm windows will significantly improve the building’s energy efficiency. A 2002 study confirmed that installing a storm window over a historic window can achieve a similar thermal performance to that of a new low-E vinyl replacement window. This experiment conducted by Lawrence Berkeley National Laboratory also noted that remaining air infiltration around the historic window and storm assembly is a matter of occupant comfort rather than energy efficiency. However, much of the air infiltration around the windows can be addressed by following the recommendations in Eliminate Air Infiltration. For more information, see the full report of the study, Measured Winter Performance of Storm Windows. Care should be taken to avoid damage to the historic window frames when installing storm windows. In addition, the historic appearance and character of a building should be considered. Storm window meeting rails and other divisions should match the location of the same elements of the historic windows. Painting storm windows to match the historic window frames will help diminish their visual impact on the building. Adding exterior storm windows to highly decorative or multi-light windows may conceal important details. In these situations, interior storm windows may be preferable. 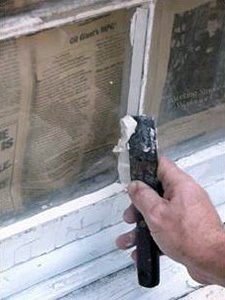 Some window repairs, such as reglazing, are relatively simple and perfect for do-it-youself. More extensive repairs may require a professional. The key to successful planning for window treatments is a careful inspection and evaluation of existing physical conditions on a window-by-window basis. Use photographs to record existing conditions and create a window schedule that lists all parts of each window with space for notes on condition and repair instructions. This can assist in prioritizing the work. The scope of repairs will be evident as a result of the inspection. Generally the actions necessary to return a window to “like new” condition will fall into three broad categories listed below. If most of the work falls into the first two categories, the windows should be repaired. But, if a large number of new parts are required, then it may be appropriate to consider investing in a good, matching replacement window. Historic solid and paneled wooden doors have good thermal properties and should be retained. Ensure that the frames and doors have proper maintenance, regular painting, and that caulking and weatherstripping are applied as necessary. Because historic doors usually perform well as thermal insulators, installing a storm door is not generally cost effective for residential buildings. The costs are high compared to the potential anticipated savings. The energy audit may help determine whether a storm door will be useful in a particular situation. In general, storm doors are most effective in cold climates on historic doors with glazing. Storm doors, if appropriate, should be installed to minimize their visual impact on the building's appearance. If possible, avoid using a storm door at the building’s primary entrance(s). A storm door design should be compatible with the architectural character of the building, and it may need to be painted to match the color of the historic door. An interior storm door may also be a possibility.